Semi-Daonil (Glibenclamide) is used to control blood sugar levels in patients who are suffering from type 2 diabetes. This medicine works by stimulating the pancreas to produce more insulin. Because insulin helps to control blood sugar levels, increasing the amount of insulin helps to treat diabetes, thereby reducing the risk of health conditions caused by this condition. 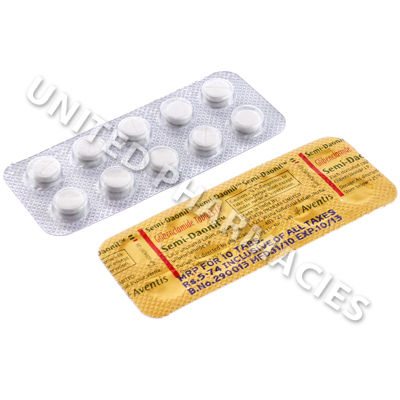 Semi-Daonil (Glibenclamide) is used to control blood sugar levels in patients who are suffering from type 2 diabetes. This medicine works by stimulating the pancreas to produce more insulin. Because insulin helps to control blood sugar levels, increasing the amount of insulin helps to treat diabetes, thereby reducing the risk of health conditions caused by this condition. Doctors often prescribe this medicine after diet and exercise alone have proven ineffective at controlling blood sugar. In some cases, it may be used together with other medicines. Semi-Daonil (Glibenclamide) tablets need to be taken as directed by your doctor. Patients are usually told to take it with breakfast or the first main meal of the day. It is essential that you do not take more than the prescribed dosage. While taking this medicine, your doctor may arrange medical appointments to monitor your condition. Remember to attend all scheduled appointments with your doctor. Other side effects include changes in the amount of blood cells, liver function problems and skin problems. Tell your doctor about any side effects you notice, doing so immediately if they are serious. If this drug is used together with other medicines for treating diabetes, hypoglycaemia (low blood sugar levels) may occur. Ask your doctor what to do if this occurs. This medicine will not treat type 1 diabetes or diabetic keto-acidosis. Always use Semi-Daonil (Glibenclamide) as you have been prescribed by your doctor. Never self-medicate or change your dosage without first consulting your doctor. The correct dosage can vary depending on your health, medical history, and the severity of the condition being treated.